Happy Chanukah and Merry Christmas from LogoTalk.Net! This month's podcast combines two related topics that are an outgrowth of the logotherapy clinical practicum that I am currently completing. Viktor Frankl's diagnostic system was based on presumed cause of a disorder and primary presentation of the disorder. 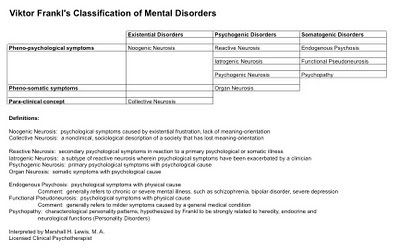 The most detailed explanation of Franklian diagnostics can be found in Frankl's On the Theory and Therapy of Mental Disorders. I made the table below to help me follow along in the book. Clicking on the picture below should enlarge it. Lukoff, D., Lu, F., and Turner, R. From spiritual emergency to spiritual problem: The transpersonal roots of the new DSM-IV category. Journal of Humanistic Psychology, 38(2), 21-50, 1998. 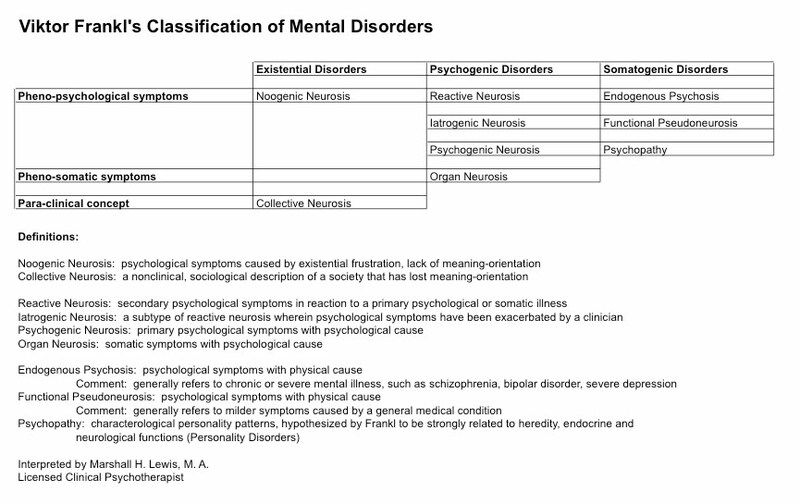 To note its absence in the proposed DSM-5, please visit http://www.dsm5.org/. 2. Logotherapy is a non-specific treatment when the source of the disturbance is rooted in physiology or psychology. Specific logotherapeutic methods such as paradoxical intention and dereflection may be helpful in such cases. In these cases, Logotherapy is seen as an adjunct to other treatments and may be combined with other treatments. 3. Medical Ministry: This is Frankl's term for the use of Logotherapy in situations of terminal illness. In such cases, Logotherapy is used to help patients retain an orientation toward the meaning of their lives up to the very end. 4. On the level of society, Logotherapy is seen as a tool to counter the influence of nihilism.